Fixmypcuk provide a virus removal service in Manchester. If you think you have a virus, spyware or perhaps even ransomware, see our "contact us" page on the left. Even if you've tried everything else, we can send a professional IT engineer to your property anywhere in Manchester within the M60 and around 10 miles outside it. Sometimes a virus can infect your computer even if you have installed anti-virus software and kept it up to date. Even after you have downloaded new software from the internet that promises to identify and remove the problem - the problem persists. A computer virus is a malicious self-replicating program. The longer you use an infected computer, the greater the chance that you will lose data, corrupt your files and operating system and infect other computers. 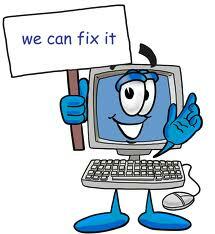 Our IT engineers can help with removing viruses, adware, spyware or pop-ups. Anything malicious and self replicating that needs to be removed. In many cases viruses, worms and trojans will alter the code in your registry and load itself everytime you reboot your computer. Software downloads won't always solve this problem. In this event our computer engineers will visit your premises to diagnose your problem. We can also get rid of the dreaded "ransomware"
We can also do any upgrades to your computer that you require, such as memory or hard drive upgrades, right up to building your own computer to your specifications. Please note: We do not supply any parts (other than memory upgrades up to 4GB which are included in the price we quote) you will have to supply them yourself. This is so you shop around for the best deal and lowest prices. All we do is install them for you and make sure they are working properly. We can give you advice on where to shop if you ask us. This not only keeps out costs down by not having to keep any stock but also helps you because you know that unlike some other places we will not "rip you off" the price we quote is the price you pay. Our IT & computer engineers will visit your home or business to remove your viruses and malware. They are educated to University level and have worked within the IT Industry for a minimum of 5 years. Our IT expert callout service is available to all customers - call 07914118004/strong>.